Why Get an AFRA Degree? UD's President Assanis with Dr. Maloba at the Presidential Inauguration on December 7, 2016. Leland Ware, the Louis L. Redding Chair for the Study of Law and Public Policy, is the author of a new book examining educational and housing policies and racial disparities. The chairman of the National Endowment for the Humanities visited with UD faculty and students while touring programs that emphasize public engagement and outreach. 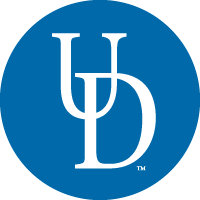 2 p.m. in the Puglisi Theatre (Room 101), Roselle Center for the Arts followed by a celebratory reception at 3 p.m.
9:00 a.m. to 11:00 a.m. at the University of Delaware Football Stadium. Gates open at 7:00 a.m. Recommended arrival time is 7:30 a.m. Student procession begins at 8:20 a.m. Commencement is a rain or shine event. In the case of inclement weather, the ceremony may be shortened. Graduates and members of their families will need tickets for June 1, 2019, ceremony. ​"An AFRA degree encompasses more than just the black experience. It teaches you about the connections between all cultures--the connections that create our communities. With an AFRA degree one can join the public sector in any community and be an asset to the people through diversity-driven community programs and development." ​"You can honor the past, empower the present and rediscover consciousness. With an AFRA degree you can work meaningfully across various disciplines, and that will inevitably help you to accomplish great things." ​"With my Africana Studies degree, I have been empowered to follow my dream of becoming a filmmaker. I am inspired to be a more conscientious and compassionate storyteller with the knowledge and strength I found from my studies." ​"In the multicultural world we call home, an AFRA degree is essential in assuring diverse economic opportunities for students, and for understanding the age-old influences of Black heritage in our society. As an aspiring lawyer, I value AFRA courses because they not only taught me about the communities I aim to serve, but also trained me to appreciate various perspectives, and to challenge society's status quo. This type of training is beneficial in any field. "The AFRA education I obtained from the University of Delaware allowed me to interact with the global business community on a level that enabled my peers from other cultures to understand and appreciate my culture as well as theirs. The global scale of my work includes Asia, Europe, South Africa and South America. The learning does not stop after graduation but serves as a foundation for continuous education."